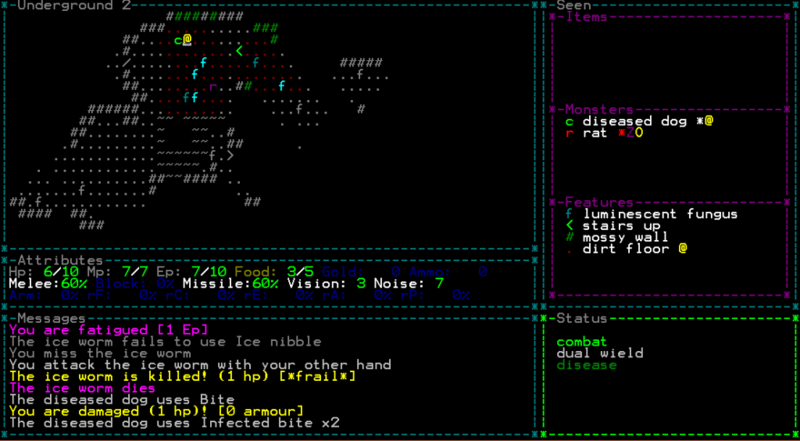 The Ground Gives Way is a roguelike focusing on randomness and improvised progression. The game has no classes, races nor XP or character levels; progress is made by finding items and equipment, and paying for training. Each game is very different and its hard to plan your character build in advance. The game has short game time but very very much content. There are a lot of possible interactions with the environment and many interesting ways of using items. The Ground Gives Way comes with a tutorial and has a simple and clean interface. It is easy to learn but very very challenging to beat. Characters will be very different from game to game since progress depends on what you happen to find. Progress is made through equipment, items and paid training rather than experience points. Hundreds of items, monsters, services, traps and features of different rarity that will make each game different from the last. No winner will look the same in TGGW. Most map features are interactive and has different effects on the player. Rapidly increasing difficulty, there is no time to be bored. There is no grinding because there are no experience points or character levels. Also, there is no hit point regeneration, so no tedious waiting. TGGW has a console-game like interface. No keys or commands to remember. Game play is still smooth and quick. Very short game time. The game could be completed within an hour. However, the difficulty increases very fast. Small levels, few levels, auto-running, a map system and a portal system makes quick and easy access through the dungeon. Interesting equipment choices where most items have pros and cons, very few trivial choices. Very simple to understand combat system. This page was last modified on 27 March 2019, at 22:05.